There are five versions of IE currently in use and at least three need attention. 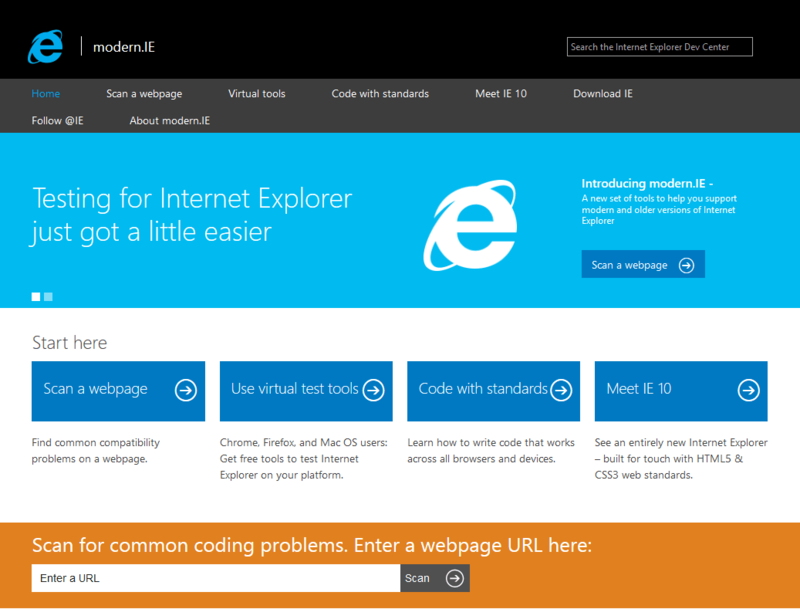 IE6, 7 and 8 have sparse support for modern web standards. Only versions 9 and 10 support HTML5 and they’re behind competing browsers. Only one version of IE can be installed and run at a time. IE is only available for Windows. Admittedly, a proportion of developers find it easier to blame the browser than fixing issues, but creating cross-browser compatible sites remains a struggle even when you retain an unhealthy knowledge of legacy IE workarounds. There are a number of IE/Windows 8-only suggestions but, even if you have no interest in adding these, the report still provides useful information which will help you locate and destroy bugs. If you’re testing a specific version of the browser, IE emulators and the F12 Developer Tools do not necessarily highlight all the problems. Ideally, you need a dedicated PC or Virtual Machine installation. BrowserStack provides dozens of desktop and mobile browsers on virtual machines which can be accessed remotely via your browser. There’s nothing to install, manage or configure — just log on, choose a platform and load your site. The service also provides tunneling facilities so you can test applications hosted on your local PC or network. Sign-up at modern.IE and you’ll receive a three month BrowserStack subscription for free. Finally, there’s 20 tips for building modern websites which contains simple best-practice advice for maximizing compatibility. The more cynical among you will claim this mess was of Microsoft’s making and modern.IE should never have been required in the first place. However, at least the company has recognized our testing problems and provided a number of practical solutions.